ICAL - OSPRE Part1 and NIE Police Promotion Exams Study Software. Online exam anywhere, anytime, any place on any device. 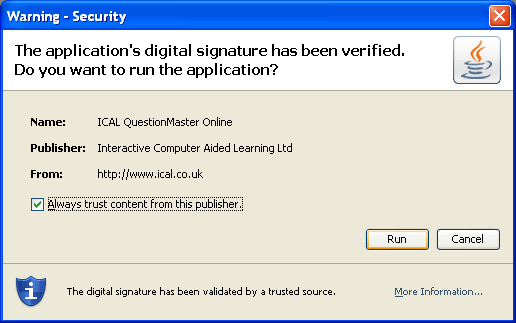 ICAL QuestionMaster Online is the latest generation of our very popular QuestionMaster software. It has been developed in Java which means - in laymans terms - no matter what system you have PC, Mac or Linux, you can now get access to and use QuestionMaster! This new version of QuestionMaster is only available online, so you do need broadband Internet for the product to work. But the beauty of an online version is you can use it from more than one location! If you do not see the above or are having difficulty launching the system it's likely you don't have Java installed on your computer. So click here to get and install java and then start from step 1 again. Mac users, Java 5 is pre installed on Mac OS 10.5 or better and is available for download for Mac OS 10.4 (Tiger) users, click here to download Java 5 for Mac OS 10.4. If you have any trouble call ICAL Tech Support for help 01704 513 529. 3. You should see the following message appear on your screen asking you if you trust the web application to run? ... and the QuestionMaster Online login screen will appear! 4. If you are evaluating the demo; Click the Try Demo button. If you have purchased a subscription; Enter the Username and Password we sent you in email and login. - Contact Us - Site Map - Online - IPLDP - NIE - NPPF Step 2 Formerly OSPRE Home © , ICAL Ltd.